Let's come together and join the biggest culture festival where more than 3.5 million people from 155 countries are expected to join. It is a platform to see the world's different culture in a single place. Come and see the world doing meditation, dance, music, fun and sharing happiness with each other. Like World Culture Festival Facebook Page. Read My Experience of Happiness Program at Art Of Living Bangalore Ashram. The Art of Living Bangalore Ashram is the main center of Art of Living Foundation. It is the international headquarter of The Art of Living. 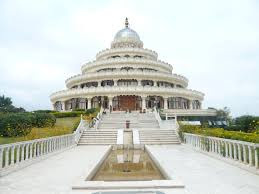 There is a big meditation hall in the Bangalore Ashram which is open for the world to come and do meditation together. 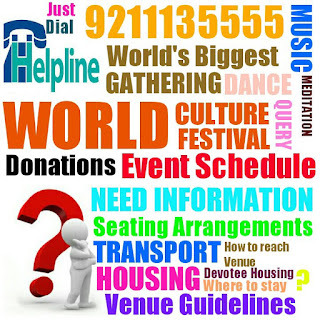 The Art of Living foundation is a non-governmental organization which is originated by Sri Sri Ravi Shanker. It is a volunteer based organization which provides various courses to teach stress management, meditation, yoga, pranayama, how to make the peaceful life, personality development, excel work and life. The primary focus of the Art of Living is to make stress free world. It works on various education and human welfare related projects. Phone Contact: +918067262626, +918067262627, +918067262628. 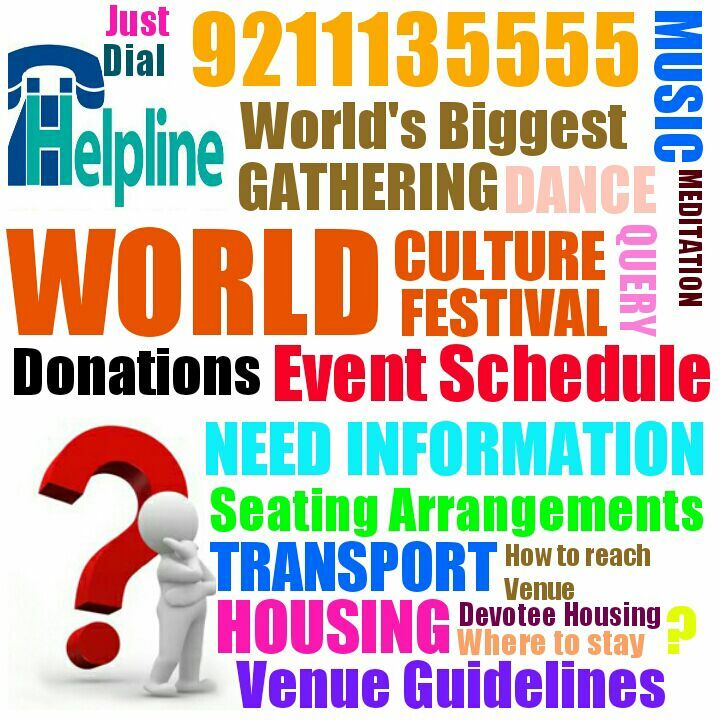 Find Art of Living Center nearby at your location. For all general queries and information. For all queries related to accommodation. For all queries related to events and course registration. For all queries related to the Ashram management. The central point of contact for all media and press. For all queries related to our Veda Agama Pathshala and poojas, homas and weddings. For all travel related queries and travel bookings. Ashram has own travel service and taxi booking service which is well connected in the Bangalore. For all queries related to ayurvedic treatments in the Ashram. Buy/Subscribe Art Of Living Magazine Rishimukh print copy or digital copy. It is an initiative to spread Sri Sri Ravi Shankar's knowledge to all over the world. Donation for Indian projects like rural development, education projects, environmental care, disaster relief etc. Connect with Sri Sri using webcasting. Attend satsang, Sri Sri talks, meditation etc. live from the ashram. Purchase online Art of Living books, audio talks, music, meditation books, health care products, personal care products, ashram food masala, stationary, puja accessories etc.